Comma Recruitment are looking for an experienced PHP Developer with a strong understanding of object oriented software development with PHP. Capable of working on the whole stack, you will have experience with both front and back end technologies, and will be able to read, understand, and question design specifications, as well as be able to identify and improve the application. Determine development feasibility within identified constraints. Evaluate and recommend options, software and tools which can help to achieve project targets. Contribute and promote software best practices and processes across the team. Participate actively in code reviews. Provide continuous technical support to your teammates. Experienced in creating and consuming various API’s. Comma Recruitment are looking for experienced Property Claims Adjusters with 3+ years experience investigating, negotiating and settling Property Claims, openings for both Commercial and Personal Lines throughout GTA. Experience with Insurer, independent adjusting firm or TPA. Investigate, appraise/scope, confirm coverage, negotiate settlement and recovery, and conduct reporting and documentation of claims in accordance with established guidelines and meet production targets in line with company expectations. Ensure the accurate and efficient payment of claim. Support company goals by participating in after-hours rotation, back-up needs and/or catastrophe situations. Meet production targets in line with company expectations. Mentor and support junior adjusters, as requested by Management. Licensed and CIP, FCIP or CRM or willing to work towards certification. Ability to plan, organize, and manage multiple demands and changing priorities. A valid driver’s license and safe driving record required. 1-3 years years of insurance adjusting industry or broker claims experience an asset. Working knowledge of Auto/Property adjusting and claim adjudication process preferred. Comma Recruitment are looking for a strong administrator with a claims/insurance background to support the claims department with a variety of tasks to assist them with the handling of claims to ensure timely and accurate processing, while delivering high quality customer service. In addition, this role supports the Accounts Receivables function. • Gather and coordinate necessary documentation and information related to the claim in order to create a notice of loss and distribute to appropriate reporting channels within established timelines. • Within 24 hours of notice or receipt of report from the Adjuster, complete the 24-hour report in accordance with client expectations. • Forward notice of loss and related documentation to insurer or broker via email. • Scan and upload to applicable file any incoming cheque payable to insureds, contractors, etc. ; notify Adjuster of payment received and any pending action required. • Follow up on past due invoices; report any invoicing queries or concerns from Examiners. • Sort through incoming mail. • Post-secondary education and/or a combination of education and related experience. • Experience in insurance adjusting or broker claims environment preferred. • Prior experience handling account receivable an asset. • Experience in a customer service environment an asset. aptitude to learn various systems. skills and mannerism throughout a telephone call experience. • Demonstrated ability to manage changing priorities and proven organizational skills to plan, review and follow-up to prioritize tasks. Planning must be done to handle deadlines, peak periods and/or unexpected situations. • High attention to detail. • Demonstrated professionalism and work ethic. • Proven ability to contribute to and work well within a team environment. Comma Recruitment are looking for a Senior Manager/ Senior Broker with Sales and Underwriting experience, success leading teams while developing broker contacts and industry relationships throughout Alberta, role can be based in Edmonton or Calgary. As a senior member of the management team, the Regional Director is accountable for the broker distribution channel within their region to sell and underwrite insurance products. This includes developing, implementing and maintaining a 1 – 2 year business plan for the Region and an optimal organization design to deliver the highest level business plan results and performance metrics. Continually assessing the competition and market opportunities within the region on a regular basis to identify strengths, opportunities, weaknesses and threats, and developing and implementing appropriate action plans. Selecting, developing and managing a capable team. Ensuring high levels of employee engagement by developing employee engagement strategies & employee development plans. Ensuring a clear understanding of all employees on our underwriting approach & philosophy. Ensuring the delivery of optimal regional results within appropriate performance metrics including quality, quantity, timeliness, productivity, customer satisfaction and financial performance. Ensuring the development and maintenance of appropriate policies, practices, selling techniques and continuous development initiatives to provide stability, growth and competitive advantage within the region. Developing and maintaining effective strategic partnerships with brokers in the region. Establishing and enhancing our profile in the industry and in the community by participating in worthwhile business and community events. Supporting retention and growth goals through the development, implementation and monitoring of function specific strategies to enhance policyholder and broker satisfaction levels. Develop & maintain strong, collaborative working relationships with all departments, leveraging the relationships to help deliver on the key deliverables. University degree/College diploma and/or CIP designation or active participation in CIP courses. 10 years of progressive business experience includes sales, marketing, underwriting operations and general management. Demonstrated effectiveness in leadership and staff development, including proven success in leading a team. Extensive knowledge of the market and the brokers within the market. Excellent influencing, collaboration and facilitation skills. Ability to identify, analyze and provide business-case solutions to complex problems. This position is responsible for investigating, negotiating and settling moderate to complex CGL and bodily injury claims, the adjuster will be responsible for direct file handling and communication with all involved parties. Fully investigate serious injuries & exposure. Provide instruction and direction to external vendors i.e. : independent adjusters, legal counsel, engineers. Calculate ultimate probable exposure and reserve accordingly. Properly maintain a diary system to monitor files. Ensure files are up to date with BI worksheet, case law, medical and liability information. Mentor and coach junior adjusters. Prepare Major Loss/Reinsurance Reports and participate in Claims Committee process. Actively participate in settlement initiatives along with both private and mandatory mediations. 5+ years of experience adjusting CGL claims. CGL experience must include a strong background in coverage (duty to defend vs. indemnify), municipality losses, construction wrap up, product liability, occupier’s liability, and environmental losses. Knowledge of regulatory and contractual obligations, medical terminology, vocational rehabilitation concepts and dispute resolution practice. Experience with internal and external audits. Detail oriented and well organized individual. Comma Recruitment are looking for talented communicators with call centre experience to provide customer service and assist members with incoming calls for billing and coverage inquiries. Full training provided including in-class education, mentoring and on-going on the job training. Salaried position with base of $40,000 – 44,000 + extensive benefits package and 3 weeks vacation. Working with multi national company, incoming call centre where service is of paramount importance. Must be strong communicators, excellent IT skills and a positive attitude. Reliable people with professional attitude along with the ability to learn and develop whilst providing first class customer service. 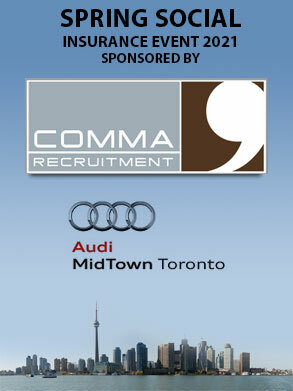 Please forward resume to info@commarecruitment.ca and highlight customer service/call centre experience. Comma Recruitment are looking for a Property Claims Manager or Field Claims Adjuster with extensive experience handling Personal Lines Property Claims. The Manager, Property Claims, will motivate, engage, and inspire a unit of Property Field Claim Specialists throughout GTA West to deliver outstanding Customer Service while following defined procedures in accordance with the Ontario Property guidelines. Comma Recruitment are looking for a talented BI/Liability Adjuster with experience handling large and complex CGL and BI claims. This position is responsible for investigating, negotiating and settling serious CGL and bodily injury claims, the adjuster will be responsible for direct file handling and communication with all involved parties. 7 years of experience adjusting CGL & BI claims. Analyze referrals and submit requests where necessary for cost approvals, etc. Analyze medical files and select the appropriate medical assessors for the file; Disability, Med/Rehab, Independent Medial Examinations, Occupational Medicine etc.